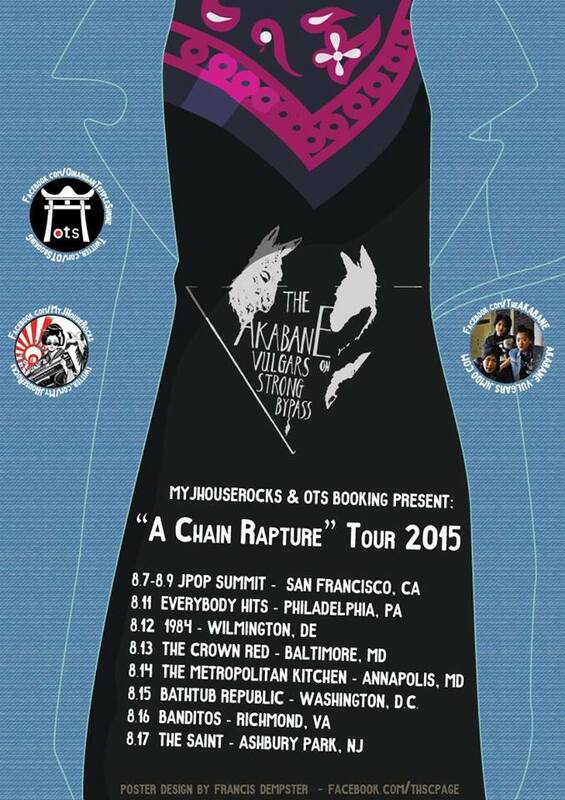 "A Chain Rapture" Tour 2015-U.S.A.
All female trio The Akabane Vulgars On Strong Bypass from Tokyo, Japan returns to North America and will embark on a U.S. tour this coming August 2015. New York, New York June 14th, 2015 - After performing for their 4th time at JPop Summit in California, the band will be traveling through the upper East Coast corridor of America bringing their unique sound of rock and blues inspired guitar paired with strong raspy vocals and a solid bass as the main component that steers the loudness of the beats which is by far.... not your typical Rockabilly. As Punk Rock being a main ingredient stirred in ever so carefully gives mixed flavors of Blues Punk, Rock, Garage Rock, Folk Rock, and Psychobilly with a Rockabilly vibe that is loud and edgy. As the Japanese Rock band known in Japan as "The Band of Live Performance", The Akabane Vulgars On Strong Bypass will literally 'rock your socks off '. The Akabane Vulgars On Strong Bypass is punk rock trio, formed in Tokyo in 2005. Bassist, Miki Uchizono was the proposer of the band as she had the idea and the right people in mind for the lineup which was great power drummer, Kei Sofue who was her classmate and singer/guitarist Yumi Uchizono who is her sister. Originally the band had played covers from Japanese garage rock bands, not making their own original songs. After 7 months had passed as they continued to play, the band made their minds up to start their own works. Yumi guesses that a common blueprint as the core concept of the band came up in their minds in those days. After this point, their theme closed in upon punk with suspecting the system. "We are the punks", this kept the band running even after 9 years had passed. Audiences began to call the bands style, rockabilly with psychobilly vibes in their music. Others called them a garage rock band. The band made a comment for this, and it says, "that a thing secured the most is our spirits which come from punk and as a band have many songs with the lyrics denouncing things oppressive against human rights". As the band took the stage at SXSW in 2012, that stage led them to returning for a U.S. tour which took two months as their tour van crossed over the country from Southern California to New York City. The band had a recording during the tour. Next year, in 2013, they came back again to the United States with 2 full-length albums. One was “Proclamation” showing their punk attitude straight, and the other was their first live-recording album “Live in Brooklyn”. Having many shows on the road, the band met a multitude of music writers. The band sometimes appeared in articles with legendary power pop/rock band, Shone Knife, and was reviewed that they are the "emerging new generation band that renew the impression of J-Rock".